The BugsCAM is the heart of your boat. It is easy to fit and will give you unbelievable control of your boat. All MOTHS should fit the system this way, including homebuilds. The best way to install a CAM system into your Moth is how I have done it on my own boat using the SERVICE TUBE KIT. If you fit the service tube through from the bow, the control rod goes down this straight to the bell crank, also your wand control lines can use this tube to enter the boat cockpit (very neat). The bowsprit slips into this and is a very strong attachment method. The Mach 2 kit and the one on the Bladerider (see pics attached) (the old setup from my boat) are bolt on setups that utilise the stock production control rod for ease of fitting the system (no boat mods). This is ok but you have to make sure that the control rod is nice and free running. The service tube kit includes service tube, adjustable control rod kit and bellcrank with the bowsprit, cam gear, adjustable wand and control lines. MACH 2 KIT includes Mach 2 moulded bowsprit, control rod extension, bellcrank, bowsprit, cam gear, adjustable wand and control lines. Et..voila! BugsCAM neatly installed in service tube. Up until now the main method of flap control for the main foil on Moths (and other T-foil boats) has been via a form of lever or other attachment to the wand that scribes an arc to deliver an initial control movement through the control rod to the flap. As the boat rises the wand drops and swings forward taking the control rod with it, in turn reducing the flap angle on the main foil so eventually lift is reduced and the boat stops rising when lift pressure equalises with the weight it has to carry (we call that ride height). The wand is usually at an angle of approx. 40-45degs back from vertical trailing on the water’s surface at this point so if the boat tries to rise further the wand will continue to move forward further reducing lift and bringing the boat back to a safe level. If the boat drops the wand is forced back and more lift comes on to keep the boat up. Over the years a lot of work has been put into working out how to deliver an action or timing of movement that gives the best control and fast trim. Depending on where the forward control lever is angled in relation to the wand determines what part of the arc you use (there is approx. 80degs of wand movement available to usefully utilise) and this can to some degree vary the timing of movement from the wand to the flap. (See Fig.1) As the wand drops (with the boat rising), using the rear quarter of the arc (A) flap movement is slow to begin with and speeds up towards ride height. This effect is further enhanced by the fact that the wand is acting in the same way in relation to the water level, as the boat rises the wands action speeds up. So with this action lift is held on longer and control action is faster at ride height. Using the lower quarter of the arc (B) gives the most linear (even) movement through the range, and using the forward quarter (C) flap movement comes off fast then slows toward ride height. Behind this is the bell crank, a two armed 90 degree lever that links the control rod with the final pushrod that goes down the centreboard to the flap. The length of either the wand lever or the control rod arm of the bell crank can be adjustable to change the ratio between them and so also vary the amount of movement delivered to the flap from the wand, this is what we refer to as the gearing speed. The control rod between the wand lever and bell crank is also adjustable, this independently tunes the amount of flap that is forced on and so is a lift control, along with a wand that is adjustable in length and a lift/ride height control as well. These last two cross over in their jobs, and adjusting them can also effect the speed of control delivery. If you back off rod length and so reducing lift, but maintain lift with wand length the wand will be longer and angled back more under the boat and the action of the wand is then slower. Increasing lift with the control rod while shortening the wand to maintain correct ride height brings the wand further forward and the action is faster. Lots of stuff to fiddle with. The main problem using the arc system is that overall the control movements are too linear or smooth to give us the control we always imagine we need, that’s why we include dials and gearing systems to try to fill in the gaps if possible, the problem being that you can get very lost in the numbers and just plain confused in moments of extreme manoeuvring and you have an intense time helming your way out of trouble. Fast trim at ride height is the slowest control speed possible to maintain height control (minimal flap movement is less drag and maintains a more constant lift) combined with as much lift as you can handle dialled in to the foil. This is fine if the conditions are glamour but there’s not much of a safety net if things turn nasty or you have some full on manoeuvring to do. So you pull some strings and rearrange your settings to increase the gearing (speed) to gain some more control, but then you upset your nice smooth fast trim with a slower bumpier one. You rob Peter to pay Paul. So, enter the cam. In simple terms it lets you escape the restrictive control patterns of the arc stylesystem and design in better control timing and movement. 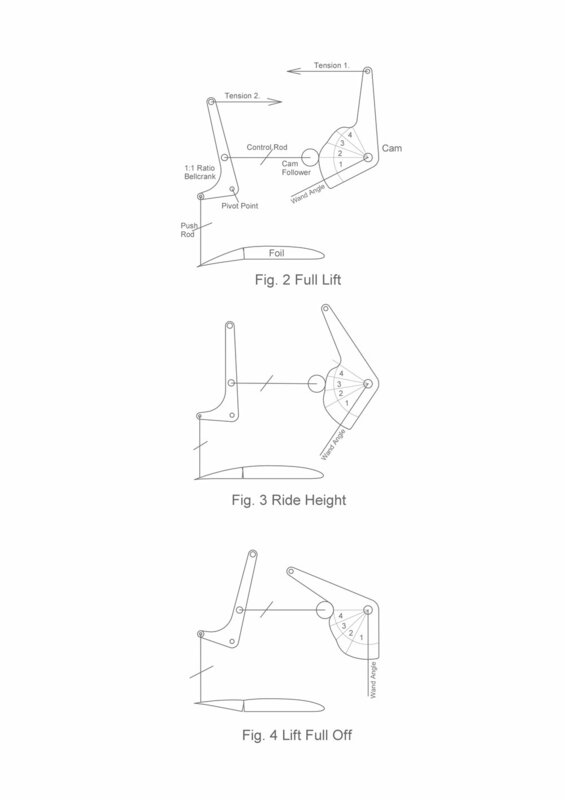 What we need is for the flap to remainon full for longer for good initial lift then to switch off to the correct amount of lift and controlmovement at ride height to maintain good trim and speed, this along with control built in to best deal with the more hairy moments we experience. The cam is locked onto the shaft that the wand pivots on and so turns with the wand. that in turn runs in two round Teflon plain bearings now within a bowsprit tube. but doesn’t need to be adjustable while sailing. 5. Then it’s pushrod down to the flap. The boat has risen on full lift to the end of the full lift zone 1 on the cam, the wand paddle is approx. 200-300mm from the bottom of the boat at this stage (this zone is a continuous radius, no action, so the cam has held the follower still and the flap stays on full), the cam follower is about to roll through zone 2, the dial down of lift to arrest the boat at ride height. hear is to develop the slowest control speed possible that enables ride height to be maintained. This is the time that a foil you have chosen of the right size/type for your weight is set to be in its most efficient section for performance. This ride height zone has to be as large as possible. The boat has strayed up too high and the wand has flicked right forward to full off on the cam at the end of zone 4. The boat will be dropped back to ride height. You can design a curve at the end of this movement to have the boat react as you want. It’s best if this is like a “notch” at the end so the cam follower stays well away from it during normal ride height. Comparing the Cam to the Lever System. The overall movement of the flap at its control point (where the pushrod attaches to the flap) can be up to 14mm max at the flap. With the Cam you can design to this or any amount of overall movement required for a particular foil. The Cam is like a curved graph so we can now see what that movement and its speed is. Let’s start a new language by calling it a speed over a duration of rotation, say 10degrees. In Fig. 6 Control Speed you can see a cam profile and the cam follower in ride height zone. full lift. This helps keep the boat from dropping too far and pushes it back to ride height as quickly as possible. Compare that action to curve A which roughly shows the more linear action of the lever system dialled back to the same optimum ride height speed of 1. You can see that it lacks the handy lift switch off (a lesser issue) and the reserve of lift close at hand if the boat dives (a big issue). Usually to combat this when conditions get rough gearing is increased and the result is curve B. As you can see there is now full flap movement to off and more lift available sooner but ride height speed has now increased to 2, too much for a smooth ride height trim but still doesn’t match the response speed of the cam which can be 3.3 when needed. then back off the rudder lift, the bow comes up letting the wand move forward so the cam follower stays on the geared down and very slippery zone 3, it feels like the wand is out of the water but it’s still in and active. This is the trim to target up and downwind, the control zones are there ready to assist when needed, remember it’s the wands position relative to the cam zones that you should focus on. and this becomes the adjustable part of the control rod. Getting that sorted eliminated any loss of lift due to rod flex and keeps rod movement friction to a minimum. After this change I sailed with the same cam and foil and couldn’t believe the improvement. As the boat was more stable without the lift changing under load I was confident to re-profile the cam with a larger ride height zone 3, this keeps the faster control gearing zones either side more distant creates a larger “sweet spot” of fast trim to aim for. almost “invisible” in the ride height zone 3 and so can be kept at a more effective ratio of area to actually be of assistance when needed for control. A larger flap needs to move less to have an effect on control than a smaller one so if correct attention to detail is observed in construction of the foils and cam speed I fail to see a problem in having a larger flap. Then you have speed and control, this will become more obvious with time. To date I have decreased the amount of overall flap I require from 13mm down to 10mm, most of this has come from taking the slow gearing right forward and having no emergency off “notch” right at the end, having too much turn off can drop the boat too much and then the boat has to recover from that drop, the rebound can be a killer. of the bell crank and any possible control rod flex and friction issues and would allow centreboards to be raised while still connected to the cam system. That’s one of the beauties of keeping the system at a 1:1 ratio. Cat classes that want to foil should really be using twin t-foils that are angled out about 8-10degs (around the angle Moths naturally cant to windward) and have control systems like this. On multi- crewed boats if they use a hydraulic line they could raise the windward board if they wanted. They would foil earlier and safer but I guess they’ll work that out in time too. The BUGS cam system is now ready to roll, part of the wait was due to coming up with better and simpler ways to put it all together, all with the focus on reliability and ease of assembly. Along with the cam is a nice telescopic adjustable wand, a must if you want to go out the full 500mm on the sprit and stay within the rules. Some of the vital cam parts, clockwise from the top we have the the cap which houses the cam and wand axle, the carbon bowsprit tube, cam follower and plane bearings that fit neatly in the bowsprit tube (control rod can come off the side or screw directly into the rear of the follower), the cam and holder and finally the wand axle. The full Mach 2 kit. Prowler Zero short bowsprit, lift on. Above is my Zero with short bowsprit (just long enough to house all the cam gear) This shows external pushrod connection to cam follower. Pushrod can also screw into the rear of cam follower and go straight down bowsprit and into the boat. Please excuse alteration mess from earlier R & D work. Bell crank and push rod. Bell crank is fixed at 1 : 1 ratio and push rod is set to length for max flap through lift off zone. Shock cord is connected to top of bell crank to keep cam follower pressured to cam. If your push rod runs free enough flap pressure is almost enough to do this alone but depending on what AoA you use it gets light towards off so you really need the extra shove. Recommend that you don't load this up to double as your pressure to hold the wand on the water, use the built-in Maystick on the cam to set up your wand pressure separately. Up until now the main method of flap control for the main foil on Moths (and other T-foil boats) has been via a form of lever or other attachment to the wand that scribes an arc. Depending on what part of the arc you choose to use, can vary the style or timing of movement from the wand to the flap. As the wand drops, using the rear quarter of the arc, flap movement is slow to begin with and speeds up towards ride height. Using the lower quarter gives the fastest and most linear movement through the range and using the forward quarter, flap movement comes off fast then slows toward ride height. Now, what we are after is for the boat to have strong lift to ride height and good control when at ride height, simple. Looking at the choices of arc positions the rear arch at first seems the right way to go, it holds lift on well and shuts off lift reasonably too, and it is ok. The lower arc choice turns off lift too fast and the movement is too linear (explanation of that coming). Using the forward arc works well if you jam on so much lift (with the dial increasing control rod length) that the wand can’t go back any more than the paddle being 200-300mm below the bottom of the boat. This means that you have max lift to break free of the water and then lift comes off quickly to ride height, lift is also available quickly on the drop of the boat. Downside, the wand jamming back on the system can cause failures and there is some drag when not foiling (not that that matters much). The main problem using the arc system is that the control movements are too linear or smooth to give us the control we imagine we need, that’s why we include dials and gearing systems to help, to fill in the gaps if possible, the problem being that you can get very lost in the numbers and just plain confused in moments of extreme stress (you know what I mean!) To have strong lift to ride height then have the boat settle to ride height with good control (that’s where gearing comes into it) is not a linear action overall. So, enter the cam. In simple terms it lets you escape the restrictive control patterns of the arc style system and design better control timing and movement. What I was after was for the flap to remain on full for longer then switch off to the correct position and timing to maintain trim, in affect creating a better, stronger bubble or cushion of lift to sail on. To start with I measured the amount of movement in the flap at the point that the control rod connects, my foil was using around 12-13mm from full on to full off. This then was to be the range of movement that the cam needed. The bell crank then needed to be made a 1 : 1 ratio so that what was happening at the cam was what was happening at the flap (you could eliminate the bell crank altogether with a cable type connection to bring the direct drive through). Next was the design of the cam, with 13mm or so of movement to build in, the choice of radius was important. If you go too small the “ramp” from on to off can be too steep which causes some basic mechanical issues and control could get harsh and twitchy particularly in the direction of lift coming back on, in reality the larger the cam the easier it is to “tune” your designed control curves and the action is smoother and engineering wise more robust. So I built the cam system with all these factors in mind and cobbled it all onto the bow of a Prowler Zero. This boat has been a bit of a test hack so was sporting a good foil to work with. In my mind things should go like this, put foil in boat and connect control rod, make sure you have full flap with wand back for take-off (control rod is still adjustable but no dial), throw boat in the water and go sailing only needing to adjust rudder trim and wand length to suit, no dial or gearing adjustment necessary. Now on the first test sail the first thing that the cam made stand out was that I had way too much AOA on the foil, the boat was sluggish getting up and pressured I could drive it off the foil, it was stalling, also with the much shortened bell crank my control rod was bending under the extra leverage the flap had and so I was getting mixed messages back from the boat. So AOA was then backed off to a new sane amount and I modified the control rod set up to suit. Next test sail the boat just jumped up to ride height now I had found a more suitable AOA for the foil, switch off at ride height wasn’t aggressive enough so a re-profiling of the cam was needed (the non-linear nature of the right numbers was even greater than I anticipated), I did however rotate the cam back a bit to address this on the day and got things working quite well, I was a happy camper. I made a few more changes to the system to improve reliability and guarantee smooth operation, re-profiled the cam now I was getting a better idea of the numbers that give the intended control, and hit the water again. Well…. It was as good as I’d imagined. The boat was strong in lift with great control and ability to maintain trim, it is much faster now too as the foil is in a much better section at ride height, and tacking and jibing is far better too, going down the Swan River in 25kts+ wind doing 30 odd knots is amazing. I keep getting nervous thinking somethings going to give but it doesn’t, the brain snaps before the boat and going into a jibe is now a time for quiet contemplation before you unleash it on the next leg! But racing is where it counts, and I’m happy to say that the old Prowler is totally on the pace and some. As I’m getting more familiar with the way the boat trims and its new capabilities’, and of cause getting my own act together again after winter, I’m getting harder to beat, and the Kiddies don’t like it, being pasted by a 56 year old grandad is not high on their list. What I like is that the boat has become so easy to sail, I’m happy to say all I need is rudder trim and wand length control. There is no need for an adjustable rod (dial) or gearing while sailing. Set the rod length for max flap and you’re done, check you have the best AOA for your foil and your weight at lift off (now made easier by the extended controlled lift zone, no flap comes off in this), you need to find the most minimal AOA with satisfactory lift which then not only lifts better but the section will be better at ride height too, and less flap up is needed to keep you down so more control also. Dial in the cam to switch off as late as possible and then set up the ramp off curve to give the desired gearing for control. I cannot see at this stage why you would need to change the gearing once you’re set. The other day we were out testing and we had marginal conditions to start with and ended with 28knts, all was fine through the range but time will tell. You can however tune the gearing “feel” by rotating the cam on the wand shaft, rotating the cam forward delays switch-off and increases lift so your wand will be more forward, shorter and so faster acting. Backing off the rotation means switch-off is earlier with the cam producing less lift so the wand will be more angled back and longer to maintain good ride height so the action will be a bit slower or softer. Anyway the next step (and some are doing this now) is to fit this system into a bowsprit, not so much as I think that the bowsprit is that important, but it’s a neat way fit the system to the boats, and any extra control gained by the bowsprit registering greater pitch movement can’t hurt. This will be completed by end of January so stay tuned.